This guide will walk you through how to set up single sign-on (SSO) for Egnyte using Azure Active Directory. To configure the integration of Egnyte into Azure AD, you need to add Egnyte from the gallery to your list of managed SaaS apps. Navigate to Enterprise applications. Then, click All applications. To add a new application, click New application at the top of the dialog. In the search box, type Egnyte. In the results pane, select Egnyte, and then click the Add button to add the application. In this section, we'll show you how to enable Azure AD SSO in the Azure portal and configure it in your Egnyte application. In the Azure portal, open the Egnyte application integration page and click Single sign-on. On the Single sign-on dialog, select Mode as SAML-based Sign-on to enable SSO. Note: On the top of the page you can switch between old and new experience. Both of those options will work correctly with Egnyte; however, there are certain differences in how they are handled. In step 1 select the Edit icon in the top right corner. Click the Save icon on the top and after the changes are saved, go back to Set up Single Sign-On. Note: Before changes take effect on Azure side a couple of minutes may pass. In step 4 copy the Login URL and AzureAD Identifier. Go to the bottom of the page and click Configure <domainname>. In a different web browser window, log into Egnyte as an Administrator, open the menu, and click Settings. Click the Configuration tab, and then click Security. Open your base-64 encoded certificate in notepad (downloaded from Azure portal), copy the content of it into your clipboard, and then paste it to the Identity provider certificate text box. Be sure to remove the BEGIN and END delimiter lines. In this section, you'll test Azure AD SSO with Egnyte with a test user called "Britta Simon." For SSO to work, Azure AD needs to know what the counterpart user in Egnyte is to a user in Azure AD. In other words, a relationship between an Azure AD user and the related user in Egnyte needs to be established. In Egnyte, assign the value of the user name in Azure AD as the value of the Username to establish the link relationship. Create an Azure AD Test User: To test Azure AD SSO with Britta Simon. Create an Egnyte Test User: To have a counterpart of Britta Simon in Egnyte that is linked to the Azure AD representation of the user. Assign the Azure AD Test User: To enable Britta Simon to use Azure AD SSO. Test Single Sign-On: To verify the configuration was set up properly. In the Azure portal on the left navigation pane, click the Azure Active Directory icon. Click New user on the top of the screen. b. User name: Email address of Britta Simon. To enable Azure AD users to log into Egnyte, they must be provisioned in Egnyte. With Egnyte, you can manually enter your users, or you can use a CSV file to import them. We'll show you how to add a user manually, but you can read more about importing users here. Log into Egnyte as an Administrator, open the menu, and click Settings. Click the Users & Groups tab, and then click Add New Account. From the drop-down, select the type of user you want to add. In our example, we'll add Britta as a Power User. a. Type the First and Last Name, Email, and Username, of the Azure Active Directory account you want to provision. Note: For existing users, find the user in the Users & Groups tab, hover over the user and click Details, and click Edit user profile. Make sure all of the details match the user in Azure Active Directory, change the Authentication type to Single Sign-On, and click Save. In this section, you'll enable Britta Simon to use Azure SSO. In the Azure portal, open the applications view. Navigate to the directory view, select Enterprise applications (under Manage), then click All applications. In the applications list, select Egnyte. Click the + Add user button. Then select Users and groups on the Add Assignment dialog. On the Users and groups dialog, select Britta Simon in the Users list. 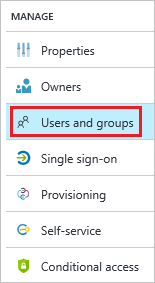 Click Select on the Users and groups dialog. Click Assign on the Add Assignment dialog. Test the setup by having a user login to Egnyte with their Azure AD credentials. Note: All SSO authenticated users will be re-directed to your SSO page when attempting to log in on Egnyte.